Yesterday three of us walked around 18 Oaks. 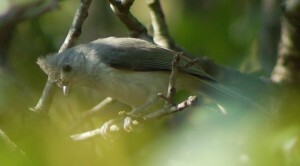 Highlights included a beaver skull, a nice view of a male Summer Tanager, Broad-winged and Red-shouldered Hawks, Painted and Indigo Buntings, many wildflowers, and geodes. The walk began at the Bathhouse where Oklahoma Master Naturalists collected. Several steps later, we all arrived at a large gazebo where the official introduction to the Pawnee Lakes and Pawnee tribe lifestyle was made. This walk was focused on the native plants of the area, as well as the usage of different plants within the Pawnee culture. The wood walk commenced along one little lake, and we passed a large post oak (Quercus stellata), one of the dominant trees in Cross Timbers. It is in the ‘White’ oak group as its leaf veins do not extend out past the lobes of the leaf. Next to that tree was a large black oak (Quercus nigra), a species that can also grow in the uplands. 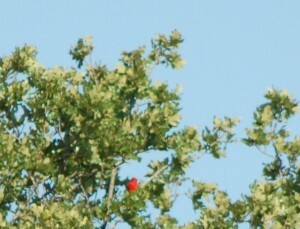 This tree is placed in the ‘Red/Black’ oak group as the leaf veins continue beyond the lobes as little bristles. It can be confused with the Shumardii oak (Quercus shumardii). Black oak leaves, if you stretch your imagination, look like large post oak leaves with bristles, but the Shumard’s leaves have deep sinuses, or inward curves, making the leaves appear much more delicate. On we walked past a black hickory (Carya texana). 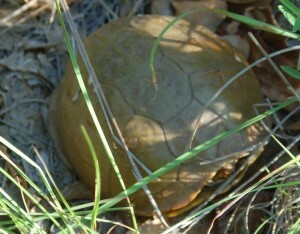 Very widespread, it has an edible nut and was tapped for its sap as a sugar source by the Pawnee. Box Elders and sugar maples were also used. The Pawnee used the wood for bows and the Pawnee hunt club. The Mexican plum (Prunus mexicana) fruit can also be eaten, and the branches were used by the Pawnee to construct baskets used in the women’s basket game. The seeds are patterned and were used as dice. Rough-leaf dogwood (Cornus drummondii) when growing in thickets form straight little trees. That wood was used for arrow shafts. The wood was used as well in tent and tipi pegs and pipes. We next encountered a Bur oak (Quercus macrocarpa), a large tree that produces the largest acorns of all native oaks. The Slippery elm (Ulmus rubra) is so named due to the mucilaginous nature of the inner bark or cambium layer. This versatile tree was used by the Pawnee as logs in construction of their summer shelter, the bark was utilized in the earth lodge, mortar and pestles were formed from the wood of elms, and the wood was also used in heat production in fireplaces during the winter. Winged Sumac (Rhus copallina) leaves were combined with tobacco and rough-leaf dogwood and used in smoking. Another name for winged sumac was ‘Sour Tops’ in reference to the fruit that could be steeped as a tea that had the taste of sour lemonade. Looking around, we saw different vines. Grape (Vitis spp.) threaded its way through the vegetation, along with Carolina Moonseed (Cocculus carolinus), also commonly called coralberry or coral-vine. The moonseed has heart-shaped leaves and its berries turn bright red in the fall. Each of its crescent shaped seeds resembles a third quarter moon or small snail shell, thus the name of moonseed. 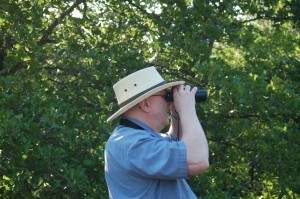 On to the Hackberry (Celtis occidentalis). In southern Oklahoma they have the sugarberry (Celtis laevigata), also a hackberry, but with narrower leaves and a preference to live by water. In either case, the berries are somewhat sweet, and the Pawnee mixed the seeds with fat, meat, fruit and corn to make pemmican, a portable, high energy protein food. We saw an American elm (Ulmus americana) on the way to the cottonwood (Populus deltoides). The cottonwood contributed its wood to be used as posts in mud lodges. In the Pawnee, the father’s parents would fashion the cradleboard out of cottonwood, while the mother’s people would create their cradleboard out of elm. On occasion, willow and box elder would be used. The boys would make tipi villages out of the cottonwood leaves, while girls formed toy moccasins. Cat tails (Typha spp. ), a.k.a. Itchy eyes (no explanation needed here during allergy season), and Bull rushes (Cyperus papyrus) were used in mat weaving. There is currently one lone stand of Bullrushes at the Pawnee Lakes. Bullrushes can easily grow nearly 10 feet tall, and like to live in a very wet environment. Yarrow was growing by another little lake. Yarrow (Achillea millifolium) derives its name from Achilles, Greek hero raised by the centaur Chiron. Achilles is said to have used the plant to stop the blood flow in wounded soldiers. The Pawnee did the same, perhaps using a different method. They would drive the stems under the skin, light the ends and cauterize the wound. It was called Moxa. The Pawnee crushed yarrow leaves to use as an antiseptic for toothaches. Near the Yarrow was the willow (Salix nigra). Another multi-purpose plant, willows were used in creation of baskets, gaming hoops, sweat lodge frames, and drumsticks. The inner bark could be boiled and liquid consumed as an antidote for fever and headaches. Smooth sumac (Rhus glabra) can be distinguished from the winged sumac by looking at its wingless unadorned stems or counting the number of its leaflets. Eleven to thirty-one leaflets compose a leaf, which is greener on top and more silvery underneath. We all jumped into our air-conditioned cars for Prairie tour #1. Along the road were white and yellow sweet clovers (Melilotus alba and M. officinalis), both invasives, with a fragrance similar to sweet grass (Hierochloe odorata or anthoxanthum nitens). Sweet grass, considered a sacred plant, does not grow here in the Pawnee area, but was used in religious ceremonies by the Pawnee in Nebraska before their move to Oklahoma. Purple poppy mallows (Callirhoe involucrata) provided splashes of color, and sport an edible fibrous fleshy taproot. Milkweeds, both the green Antelope Horns (Asclepias asperula) and orange Butterfly Weed (Asclepias tuberosa) were in the fields. Several mints in the Monarda genus, especially the Lemon Monarda (Monarda citriodora) were represented. The Pawnee called the lemon Monarda Indian Perfume Mint due to its lemony-like sweet scent. Another species of Monarda was employed as a wash and mint tea, but it was more pungent. A wild Bergamot Monarda (Monarda virgata), or red-spotted horsemint, grows in the eastern half of Oklahoma, It has a scent or flavor similar to the bergamot orange rind used in Earl Grey tea! We passed a field of wild onions (Alliums pp. ), invasive non-native Johnson grass (Sorghastrum halepense), some lilac colored Prairie Verbena (Verbena bipinnatifida), and low-growing Catclaw Sensitive Briar (Mimosa quadrivalvis) with its Mimosa-like pink round flowers and leaves that would fold together when touched. Curved prickles dot the little branches. Native sage (Artemesia ludoviciana), in the daisy family, looks somewhat similar to ragweed and salvia. It was growing in several places. The name ‘sage’ in Native sage is a shortened version of sagebrush. It was waving its flexible silvery green leaves in the air and those leaves are very aromatic. Dotting the area were wild geraniums (Geranium carolinianum), also known as the Cranesbill. A column in the center of the spent flower is used to eject seeds, and it does look like a little cranesbill. At our unscheduled stop, we were treated to the Compass plant (Silphium laciniatum). Its leaves may orient north-south, but it has a taproot that can go down 15 feet and a ‘sunflower-like’ flower which may shoot up over 10 feet tall. The Pawnee chewed the plant resin as a gum. I read where this plant can live 100 years. Nearby was a Buckbrush (Symphoricarpos orbiculatus) or other common names of coral-berry or Indian currant. It is a shorter shrub that puts on purplish-red berries in the fall that last into winter. This is the time to bring up the confusion created by using common names. The Carolina Moonseed is also commonly called coralberry. 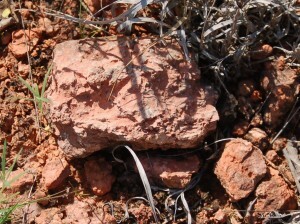 The same common name is used for both a vine and a shrub growing in the same area with red berries; thus the reason for the scientific name following each plant. Prairie Stop #2 by the tower overlooking a steep hill side. Light purple coneflower (Echinacea spp.) was saved from the brush-hog with help from the Mayor of Pawnee. 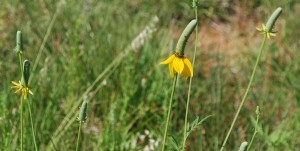 There are 4 species in Oklahoma, with one a yellow color found in Murray County, another with narrow leaves, etc. The Pawnee liked to throw the stems together so the seed heads would stick to each other. Seed heads were also used as combs. Blue Sage (Salvia azurea), a true sage in the mint family, can grow over 2 feet in height, with tight blue tubular flowers blooming at the top. Some Indigo (Baptisia spp.) plants were seen with their 2” seed pods. The flowers had already come and gone. The leaves are blue-green in color. The drought tolerant Black-eyed Susans (Rudbeckia hirta, var. 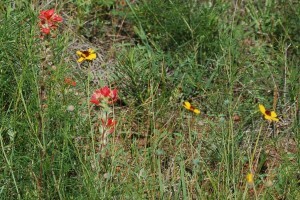 pulcherrima) were making their prairie appearance, along with the Lead plant (Amorpha canescens). 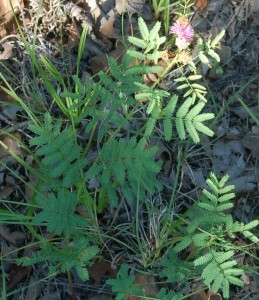 It too looks like a Mimosa relative in shrub form, but with purple flowers. 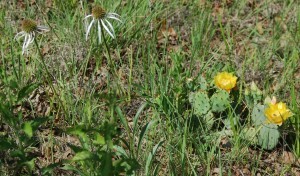 Lead plant is a decreaser indicator species of prairies. Too much munching on them and the plants disappear. The Pawnee used the leaves to spread on the ground for meat drying and preparation. Yucca (Yucca glauca) stood out. From this plant the Pawnee made cording also used in fires and drills. The bow was hooked up to the cord and rapidly rotated back and forth to start the fire. Saponins in the Yucca root formed soapy liquids used for washing hair and other things. On a much smaller scale was the Prairie Sandbur (Krameria lanceolata). 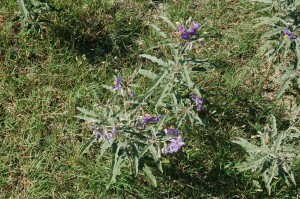 Its small purple flower has a unique design, with wine colored petal-like sepals housing much tinier elevated actual petals inside the ‘flower’. Remember, it is very small. But this bur is not in the grass family, nor is it particularly abundant. Branches can trail close to the ground and be 2 feet long as the whole plant grows from its woody roots. We did not see the infamous Buffalo Gourd. Cucurbita foetidissima, (a.k.a. fetid or stinking gourd) is indeed a member of the cucumber family. It grows like a squash vine, has yellow flowers, and the fruit looks like small round watermelons that ripen to a golden color. The fruit is edible when very young, but becomes intensely bitter as it matures. The plant thrives on little water and supposedly has a huge underground tuber. It takes over half of a year for the gourd to dry out, with various molds growing on the surface. The seeds detach and rattle about inside, but may remain viable for years.